Male (Maldives) – Oct 3, 2018 (travelindex.com) – SAii Lagoon Maldives will open as part of Curio Collection by Hilton, one of Hilton’s 14 market-leading brands in 2019. Curio Collection by Hilton, a global portfolio of more than 55 hotels and resorts around the world, offers travelers unexpected and authentic experiences at more than 55 one-of-a-kind hotels and resorts around the world. SAii Lagoon Maldives will be managed by S Hotels & Resorts under a franchise agreement between Hilton and Singha Estate Public Company Limited. 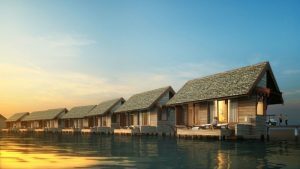 Set to open in 2019, the 198-room resort will be located in Emboodhoo Lagoon – an enchanting natural wonder surrounded by white sands and cerulean seas. The resort will be 15 minutes by boat from Velena International Airport and offer easy access to CROSSROADS, the first and largest integrated tourist destination in the Maldives. SAii Lagoon Maldives offers modern travelers a private sanctuary enhanced by creative art and design, artisanal cuisine, a soundtrack of curated music and heart-made hospitality. The modern resort will feature spacious deluxe rooms, beach villas and overwater villas with inspired tropical designs created by acclaimed architect Bill Bensley, who has conceptualized some of the world’s most iconic hotels, resorts and spas. All accommodations feature custom-made furnishings, outdoor decks and a host of playful inclusions, such as handcrafted puzzles and ‘creature comfort’ pillows, complemented by comfortable social spaces, quality restaurants and access to the globally-renowned beach club brand, Café del Mar. The Hub is a unique gathering and social space that offers countless opportunities for guests to kick back and get creative. Guests can pick out their own treats from the Snack Box, which offers a complimentary collection of healthy, family-friendly refreshments, while an inspiring Aroma Lab will allow guests to create their very own bathroom amenities – selecting a base product, such as shampoo, shower gel or body lotion, and pairing it with one of the Lab’s many scents. The spread of creative in-house dining options at SAii Lagoon Maldives extends from an eclectic daily breakfast at Café del Mar, to gourmet coffees, specialty teas and meals on-the-go at the casual resort café, bean/Co. For a more substantial meal, guests have a choice of stylish and uniquely distinctive themed eateries serving a combination of healthy fare, Mediterranean classics, fresh seafood and Thai-inspired creations. The first and largest integrated tourist destination in the Maldives is an easy stroll across a footbridge from SAii Lagoon Maldives and will offer an extensive array of attractions for visitors, including a 30-berth marina, retail and dining outlets, Maldives Discovery Centre, a marine life protection centre, an event hall and a junior beach club. Book your luxury resort in the Maldives and around the world at best rates available. Pay at the hotel. Book now at HotelWorlds.com and Earn HolidayClicks Points for every dollar spend!